As a teen Diana suffered from terrible dermatitis, and at fifteen, she found her first book about yoga. She read this yoga book through and applied what it was teaching…it healed her skin. Not only that, but the meditation and spiritual philosophy included in that book she also practiced, giving her skills to become calmer as a person. At age fifteen, Diana already had the personal discipline, the personal focus, to apply self-taught yoga from a book! I find this impressive because she didn’t come from a family which was in line with this in any way, they didn’t even know about these things. It was all in the book. 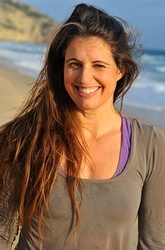 Ten years passed and at age twenty-five (then in Australia) she began attending regular yoga classes. Her education at that point had been in Physical Education, but she felt something was missing. It was here, in yoga, where she realized that the yogic philosophy…understanding and applying it…makes big changes to her life. What she had been missing to that point, which yoga provides, was connection, the opportunity to know herself…in yoga she feels “it’s very complete”. So she began to study and soon after, took her first Teacher Training at a Sivananda Ashram in Austria. Located in southwest Portugal, Algarve Yoga features two venues, both surrounded by nature. Quinta das Pedras on the south coast, hosts the Yoga Surf Holidays and Yoga Delight Holidays, while Monte Velho on the west coast, offers the Yoga Detox Retreats. People who visit Algarve Yoga say they are “inspired by all of us (the whole team) because we’re all doing what we love, whereas most people are doing what they have to do or need to do”. When Diana said this it was like she reached out with both arms and scooped up her team as being loved and supported….that this is how much she values and acknowledges and validates the contributions of her entire team toward guests having an amazing and welcoming experience at Algarve Yoga. It was beautiful and rare to hear a team acknowledged in such an all-encompassing way. Here “people can see that it’s possible to do what you love and that it can bring happiness” and she always finds that people connect with that. Living close to nature is also a big influence on how people feel at Algarve Yoga. For Diana, satisfaction comes with that little change that people can take home…having offered her little influence in the world. Changes can come even after just one week of taking good care of yourself…it can simply take a week to reconnect, and that change goes home with you…she is happy to be a part of planting that seed. Teaching yoga is really her passion. After twelve years of teaching she felt a change was needed. She took a workshop with Teresa Caldas in Vijnana yoga. This style so contradicted her old teachings that at first she resisted it but kept going. She then stopped teaching for a year so she could really learn and absorb the experience of this new style before taking it to others. Prior to Vijnana yoga, Diana definitely went through a period of feeling waves of “Oh, I have to do yoga”, almost groaning when she rolled out her mat for asana practice. But since meeting Teresa Caldas three and a half years ago, this has all changed. Pranayama though is the huge benefit to her, becoming very important to her practice in the last two years. She doesn’t know why this change, to include more Pranayama, as it wasn’t so important to her before…but she wonders if maybe it’s age shifting her into a different expression of practice. As she explains, the older we get, muscular strength lessens, but if we can “activate the inner light to grow stronger and stronger through breathing”, she feels the benefits. She experiences that there is a real power from breathing, and the energetic gains are much more than from asana. Working with the vayu (as studied and practiced in Vijnana yoga), the “inner light” becomes very powerful and she loves the inner strength from that.